Intelect Transport 2-Channel Electrotherapy Lightweight design, along with battery-powered option and custom designed mobile carrying bag, make transport easy. 'On-the-Go' Electrotherapy. 2 channels of electrical stimulation output. Ten user-defined memory positions for User Protocols. Independent intensity and parameter controls for each channel. 4 standard waveforms on board: Interferential, Premod, Russian and High Volt. Logical control system and a large easy to read graphical LCD display. Unit uniquely designed for tabletop, wall mount, or mobile use. 110V or battery-powered option. Two-Year Warranty.Mains Power: 120-240VAC, 50-60Hz. Electrical Safety Class: Class 1, Electrotherapy Type BF, Ultrasound type B. Safety Tests : UL/IEC/EN 60601-1, IEC/EN 60601-1-2, IEC 60601-2-5, IEC 60601-2-10. TENS/EMS Units & Stimulators can be found in our extensive online collection of products from globally recognized and trusted brands, including Chattanooga. 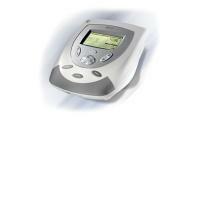 An excellent option to consider is the Intelect Transport 2-Channel Electrotherapy.